Here’s hoping clear skies will come our way this month. First, there’s the total lunar eclipse to watch in the early a.m. hours of October 8 (evening hours of October 8 if you’re reading this from Australia). That’s super exciting, so it’s probably destined to coincide with cloudy weather. 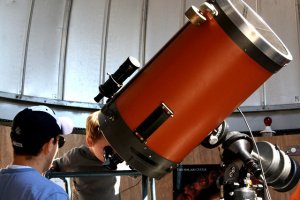 But I’m also looking forward to the New England Fall Astronomy Festival later this month. Events will take place on the west end of the University of New Hampshire Campus (Durham) at the UNH Observatory. The weekend kicks off on Friday, October 17, with a 6 p.m. lecture by Carolyn Porco, Imaging Science Team Leader for the Cassini-Huygens Mission to Saturn. After the lecture and a Q&A session, clear skies will bring a chance to look through some great telescopes and listen to some star talks. The festival continues on Saturday (10 a.m. to midnight), with more observing sessions, activities for the kids (model rockets rumored! ), talks, and clinics. I admit I’m pretty excited by the idea of a weather balloon launch. Here’s a write up about a previous year’s NEFAF, in case you’re wondering what an “astronomy festival” looks like. Full disclosure: John Gianforte and I work together at S&T. Therefore, I know that it’s going to be a top-notch event.